Is Normandy just the beginning of Nokia's Android ambitions? Rumors of the Nokia Normandy are heating up, but new whispers say it may only be the first of a whole pack of Android-powered phones from the Finnish firm. Word from an Artesyn Technologies source is that says the phone company will have more Android phones coming this year, including several higher-end models. Supposedly this new slew of phones powered by Google's mobile OS will be revealed sometime between May and June. The source says the phones will come at different price points, but there's no word if it will be able to reach the Play Store unlike Normandy. Microsoft, which is in the final stages of finalizing its purchase of Nokia, has reportedly put its new acquisition through the chop shop and leaving it with the low-end Asha and feature phone departments. Meanwhile, teams involved with Nokia's more notable hardware bits including PureView cameras, HAAC microphones, and ClearBlack displays have been moved to Redmond. Taking these technology shifts into account, its possible that a majority of Nokia's Android phones could come as budget handsets with the Asha overlay - essentially a faux-smartphone tiled, touchscreen interface. 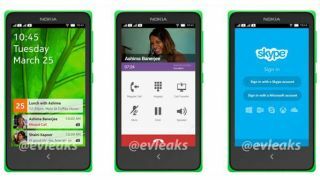 Thus far, the only Android Nokia handset we've seen evidence for is Normandy. The phone will reportedly debut at MWC 2014 and it's already shaping up to be an abnormal little droid. Instead of accessing the Play Store, Microsoft plans to supply the handset with its own apps, including Here Maps, MixRadio, and Nokia's own shop of Android apps. It's already odd enough to see an almost-Microsoft-owned company putting anything but a Windows Phone OS on any handset let along multiple, but we'll let you know if we spot any other goodies from Nokia featuring Google's green bot. Nokia might have some kind of Android, but the Motorola Moto G has KitKat.